Calcutta Jain Temple (also called Parshwanath Temple) is a Jain temple at Badridas Temple Street is a major tourist attraction in Kolkata (Calcutta), India. 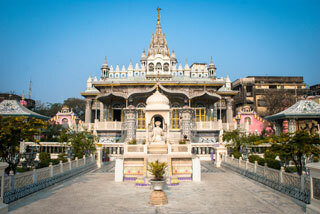 The temple was built by a Jain named Rai Badridas Bahadoor Mookim in 1867. Pratishtha was done by Sri Kalyansurishwarji Maharaj. This article uses material from the Wikipedia article "Calcutta Jain Temple", which is released under the Creative Commons Attribution-Share-Alike 3.0 License.